Updated Friday October 2, 2015 by Blue Water Springs Park. Toward the end of fall while the weather is cooling down the basketball court heats up at Blue Water. Under the direction of our basketball director and coaches we field teams from ages 5 - 14 boys and girls. Our parents and family members pack the stands to watch their player move the ball up and down the court showing off his or her passing, dribbling, and shooting skills. 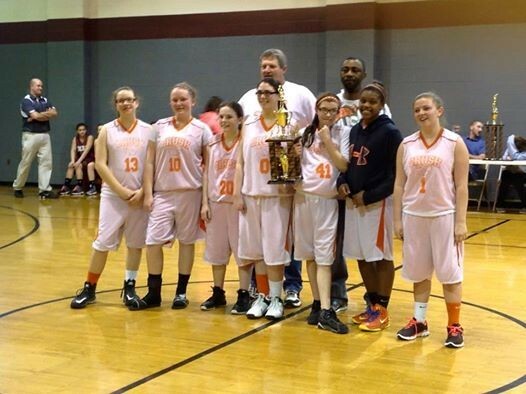 This year our 12u girls team went back to the State tournament showing their desire to be the best all around! External links are provided for reference purposes. Blue Water Springs Park is not responsible for the content of external Internet sites. Copyright Blue Water Springs Park All rights Reserved.